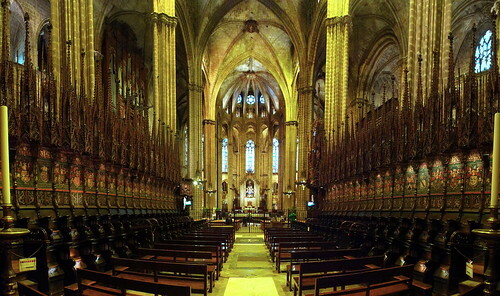 The view (created by stitching 7 wide portrait shots together) towards the central nave from the choir seats and pews at Barcelona Cathedral, Catalonia, Spain. In the 4th century a Roman basilica was built on this site. It was destroyed by the Moors, Al-Mansur in 925 AD. The remains of this basilica can be seen in the City History Museum. Around 1046, a new cathedral was commenced at the initiative of Bishop Guislabert. Construction began for the current day Cathedral in 1298, during the bishopric of Bernat Pelegrí and the reign of King Jaume II, known as "the Just". The work on the present-day façade of the Cathedral remained unfinished until the end of the last century, being completed by the architects Josep Oriol Mestres and August Font i Carreras, taking inspiration from a drawing from the 15th century by Mestre Carlí.